It is right that I have a huge tendency on listening to piano trios and even I have been listening to traditional mainstream ones, Nordic scene is my main region of interest. This scene produced amazing pianists and piano trios since jazz spread to Europe. Now I will present one of them to you. 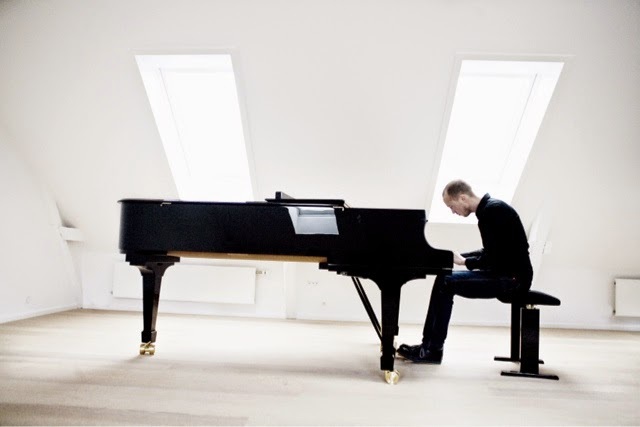 Søren Bebe is among prominent jazz pianists in Denmark nowadays and this is a review for his trio album Eva from 2013, about which I should certainly have written two years ago. Eva is Søren Bebe Trio's fourth album and the experienced jazz musician Marc Johnson is playing the bass differently than the previous albums, in which we see Niels Ryde as the electric bass player. Anders Mogensen has always been the drummer in these albums. The album was recorded and mixed by James Farber (assisted by Ted Tuthill and Owen Mulholland) on September 2012 at Sear Sound, New York. John Fomsgaard mastered the album at Karmacrew. Lyrical compositions, amazingly soft piano tone, minimal but granular drums and masterful American touches on double bass are highlights of the album. The album starts with very attractive compositions of Anders Mogensen (all the rest belongs to Søren Bebe): Simple and dignified, Freshman has no hurry to rush into your ears. However it is still powerful enough to hit you with the first notes. Søren's short solo introduction gives you the main theme and idea. 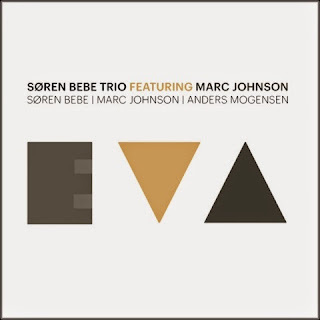 Marc Johnson's familiar tone is very well fit into Anders Mogensen's implicitly swinging minimal rhythm lines. Adding the modest but impressive bass solo we can say that it is already proposed by the musicians in the first piece that they are there to give some qualified performance for some qualified compositions. L.R.P. is one of the most emotional pieces I have heard lately which is touchy especially for its piano partitions. It obviously sounds like a mourning or a homage. The solo performance of Marc Johnson surrounds the room like a velvet fabric. The bass riff in the entrance of Heading North gives a tensional feeling to the overall aura. Søren plays a long improvisational part over the background created by the -hardly changing- bass line and drummer's soft touches. The instant when the piano catches the bass on the same notes and the little energy rise after that, create a silent groove by means of Anders Mogensen. Luft (meaning Air in Danish) is a brief and naive composition. It is like a brief dialogue between the bass (the earth) and the piano (the space). The subject is what they have in between: Air. Started from a low tempo introduction, Flying High is really like a rocket and you don't understand when it started to fly. The area the pianist and the drummer let Marc Johnson for his solo feels like the time the rocket leaving the space craft alone just after the atmosphere: Silent enough to hear the low frequencies produced by the rumbling earth... (Yeah, I know sound is not transmitted in media-less space). Dragging is an interesting piece of the album with the silenced toms' sound. The qualified and serious piano performance look like improvisational. Sne (meaning Snow in Danish) is a characteristic performance of the album - cool, attractive and relaxing main themes are played mostly by the lyrical style piano and it is supported by minimal bass and drums. If there is something called Nordic piano sound, you can hear it in this piece easily. One Man Band's entrance sounds like promising a lot for what comes next. Another catchy melody from the piano is accompanied very well with a solid bass and drums. Soren achieves a nice improvisation while the others are keeping the energy always at top. The dynamic range Anders using on his set is very wide and this is responsible for the successful overall energy. Eva is Søren's 2 year old baby girl. The title track obviously carries the pianist's sincere love to his new born baby at that time. The hope, concern, love and devotion... They are all included in the main theme and the softness of the touches to the keys have a certain relation with a baby. Change starts with parallel lines of the bass and the piano. This harmonious dialogue -which is sometimes dominated by one of them- is accompanied by some hand strokes on snare drum. Good Times is like the hopeful end to this nice album. It is nice to hear some bow from Marc Johnson. Hi Søren, you're welcome. It's my pleasure to review your album. I am looking forward to listening to the next trio album.